The state allocated up to $190 million for the competition and another $10 million through the Governor’s Aviation Capital Grant Program to support safety, infrastructure and economic development projects at airports across the Empire State. This $200 million in new funding is in addition to $90 million authorized for core airport improvement projects statewide as part of the governor’s $29 billion five-year State Transportation Plan. Upstate general aviation and commercial service airports were invited to apply, and successful airports could receive up to $40 million each. A total of 16 airports applied, and to date, four received awards totaling $153.6 million. (See list for winning airports and their individual awards.) Remaining funds will be allocated in the near future. Applicants were required to provide detailed project budgets as well as plans, drawings, reports and other supporting documents. Applications were evaluated on design innovation, passenger amenities and customer experience enhancements, cargo facility expansion, long-term job creation and generation of economic opportunities at and around the airport. 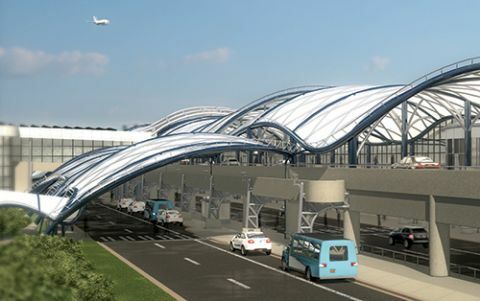 Eligible projects included retail, hotel and conference center development; enhanced highway and transit access; improved security and screening methods; terminal expansion and rehabilitation; runway extension and rehabilitation; boarding, concourse and concession area enhancements; and aviation-related technology improvements. To illustrate another aspect, Karas cites the recent decision of the New York Mets’ triple-A farm team to relocate from Las Vegas to Syracuse, NY. “One of the main reasons for the move was the attractiveness of the Syracuse Airport facilities,” he states. ROC, the first winner announced, received $39.8 million for its $79 million project. “By transforming the Rochester Airport, we create a world-class hub to drive economic activity and growth throughout the region,” said Governor Cuomo in September 2016. According to a 2010 Department of Transportation Aviation Report, ROC generates more than $800 million in economic impact for the region each year and supports approximately 10,000 full- and part-time jobs. • state-of-the-art technology to make travel easier for deaf and hearing-impaired visitors. The Greater Rochester area has one of the nation’s highest per capita populations of residents who are deaf or hard of hearing, informs Moore. The National Technical Institute for the Deaf, the world’s largest college for students who are deaf and hard of hearing, is located in Rochester. The airport has taken a proactive approach to assist this population by installing hearing loops, an FM system that helps visitors receive messages from the public address system via T-coil devices in their ears. ROC is also working with the Rochester Institute of Technology to install screen devices at ticket counters and other key transaction points that translate American Sign Language into voice or printed content. • installing programmable glass walls that display flight information and wayfinding information. Previously, the airport had no airside food and beverage options, Hopper informs. Initial plans called for adding a 3,000-square-foot concession post-security, but airport authorities ultimately placed the new food and beverage option before the TSA checkpoint, because ELM’s post-security area is only open for a few hours in the morning and afternoon. “We settled on kiosks post-security, with the main vending areas pre-security, since a major vendor post-security would not be able to sell product when the area was closed,” Hopper explains. Airport officials are particularly pleased with plans for the three new courtyards. One is inaccessible to the public but visible from the baggage and security screening areas; another can be accessed from the landside restaurant; and the third is a post-security space passengers can enjoy while waiting for their aircraft to arrive. He notes that the program’s tight deadlines have made the design and construction process challenging, but all the stakeholders see the value of the projects. PBG was just putting the finishing touches on a $60 million terminal expansion when the upstate project competition was announced. Inspired by the chance to win funding for future improvements, they pushed through the natural post-project fatigue and began thinking about other items on their to-do list. Although they had multiple ideas to enhance the passenger travel experience (civil site work, parking lot pavement repairs, further improvements inside the terminal), officials focused on cargo and general aviation projects for the airport’s application. They also keyed in on the business-to-business development described in the competition guidelines. • renovating the car rental building to speed vehicle turnaround. • installing new terrazzo flooring and energy-efficient lighting. The various projects support the airport’s goal of creating a seamless passenger experience—which begins when travelers are dropped off at the curb or park in the garage, notes Airport Director Christina Callahan. Rather than encountering a solid wall, travelers will be greeted with a translucent glass wall with a sightline through the terminal to a matching glass curtain wall on the other side of the TSA checkpoint. 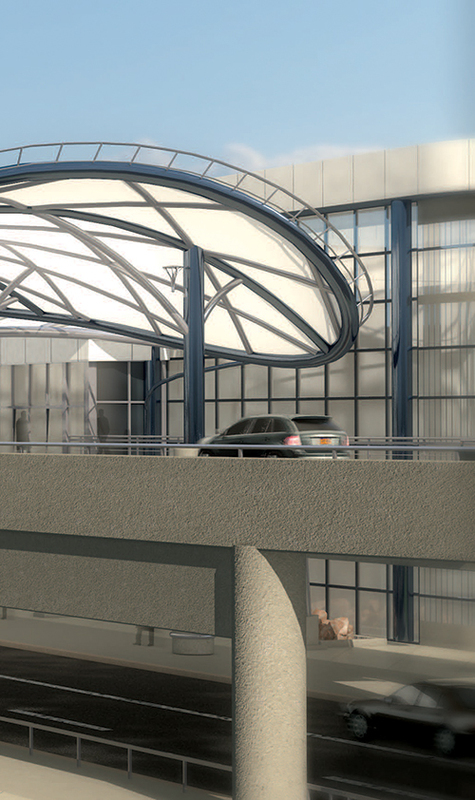 Overhead, a translucent glass canopy filters natural light onto the terminal roadway and sidewalk. Inside, travelers are welcomed into a bright, open space. The grand staircase and stone wall in the central lobby provide easy places for passengers to rendezvous with colleagues or loved ones. “From an architectural design perspective, we’ve deliberately constructed and highlighted features that can serve as reference points for travelers,” explains Callahan. In reflecting on what the award means for the airport and community, Callahan says that the state funding has helped the airport authority create a world-class facility much sooner than would have been possible otherwise. Moreover, the award allows authority funds to be directed toward additional important projects and priorities.